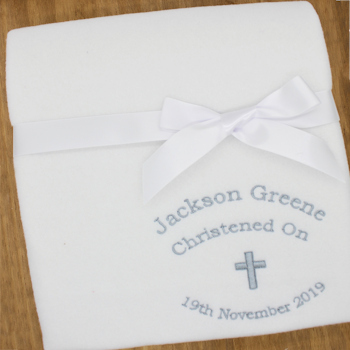 Soft white fleece Baptism Christening or Dedication blanket embroidered with baby's name and the special date. Cute baby blanket is made from polyester polar fleece fabric and measures 100 by 75cm. Overlocked blanket edging. Cute baby blanket is made from polyester polar fleece fabric and measures 100 by 75cm. Overlocked blanket edging. Easy to machine wash and fast to air dry. Personalised with a embroidered name or little message on this polar fleece. Just fill in the exact text you want and choose the thread colour, please check spelling.